Johnston Farm Friends Council Board member Gary Anderson, Ohio History Connection Director of Architectural Services Fred Smith, Johnston Farm Friends Council Board member Margaret French and Johnston Farm & Indian Agency Site Director Andy Hite discuss upcoming renovations to the John Johnston family home. 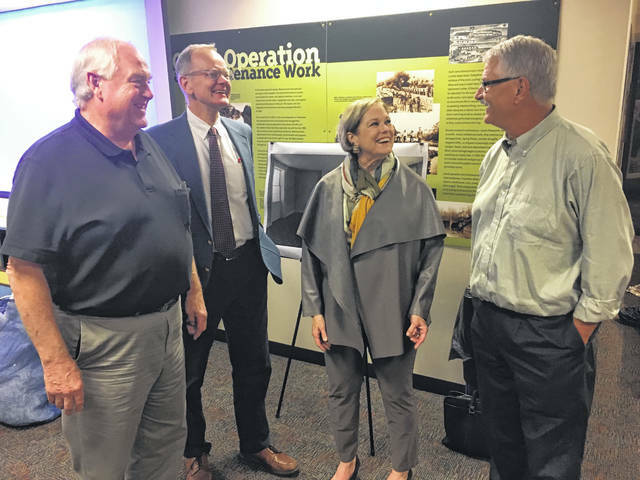 PIQUA – Supporters of the Johnston Farm & Indian Agency gathered last week at the Johnston Farm Museum to learn about a campaign to raise funds to restore the site. The Johnston family home was open for tours so that donors who had not visited the home for some time could see the home before renovations begin. Johnston Farm Friends Council President Michael Gutmann welcomed the guests, which included two Ohio History Connection board members. They were Crown Equipment CEO Jim Dicke II and USAeroteam CEO Suhas Kakde. The Johnston Farm & Indian Agency is one of the more than 50 sites and museums throughout Ohio managed by Ohio History Connection (formerly the Ohio Historical Society). He also introduced Johnston Friends Council board members, as well as state Sen. Bill Beagle and Piqua Mayor Kazy Hinds. Johnston Farm Site Manager Andy Hite spoke briefly about the original restoration of the Johnston family home. He said the Johnston Farm was purchased by the state in 1965. Restoration of the home began in 1968 and was completed in 1972. Ohio History Connection Director of Architectural Services Fred Smith outlined the scope of work that will be undertaken within the home. “If John Johnston were to return, we would want him to be able to walk through the front door and say ‘I am home,’” said Smith. Smith detailed the paint analysis undertaken at the Wilson House in Shelby County in an attempt to find the correct colors that would have been used during that time. He also detailed how the oxidation of metals mixed with the paint, especially copper, would cause the paint to change in hue over time. Longtime Johnston Farm Friends Council board member Margaret French announced the Sharing the Vision Campaign Committee. They include Campaign Co-chairs Michael and Elizabeth Gutmann, Richard Adams, PhD, Mike Barhorst, Brett Baumeister, Cheryl Buecker, Karen Crump and Scott Mueller. Margaret French and her husband, Dan, are honorary co-chairs. The total amount to be raised is $557,235.60. In addition to the work on the Johnston family home, the restrooms will be made handicapped accessible and there will be work done to the exterior of the museum building. Solicitation for the campaign is expected get underway in the next couple of weeks. The Johnston Farm is located at 9845 Hardin Road, Piqua. For more info, visit johnstonfarmohio.com or call 800-752-2619.